Still Waiting: No Decision Yet On Big Supreme Court Cases : The Two-Way With little time left on the 2012 term, cases on affirmative action, gay marriage and the Voting Rights Act are still outstanding. The court could rule on any of these as early as today. 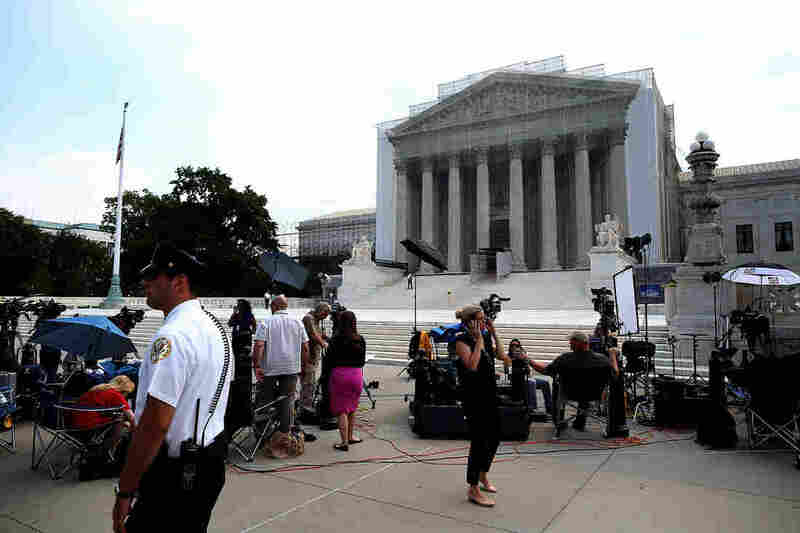 Members of the media wait for court rulings in front of the U.S. Supreme Court building on Monday. The Supreme Court did not hand down any of the big opinions we were waiting for. That means that as its 2012 term comes to a close, we are still waiting for major decisions on gay marriage, affirmative action and voting rights. The Court will hand down decisions again on Monday at 10 a.m. ET. We'll be here. -- Agency for Int'l Development V. Alliance for Open Society Int'l Inc.: In the case, the Court was considering "what speech limitations can be placed on private groups that receive federal grant money to fight HIV/AIDS abroad." Per SCOTUS blog: "The Court holds that the policy violates the First Amendment by compelling affirmation of a belief outside the scope of the program." Chief Justice John Roberts wrote the majority opinion and Scalia and Thomas broke ranks and dissented. -- American Express Co. v. Italian Colors Restaurant: Per SCOTUSblog: "In Plain English, this means that if you have a contract with a business in which you agree to arbitrate a dispute but it says you can't get together with other plaintiffs in a "class action," that contract will be enforced, even if it may be too expensive for you to pursue your own claim given what you might win." -- Descamps v. United States: Per SCOTUSblog, the decision makes it "harder for the government to use the facts of a prior conviction to enhance a federal criminal sentence." At around 10 a.m. ET, the Supreme Court will begin handing down some of the final opinions of their 2012 term. The court usually sets out for its summer recess at the end of June, which means we're quickly running out of time for the justices to issue their opinion on four major cases argued earlier in the term. — Fisher v. University of Texas, a key test of affirmative action in higher education. — Shelby County v. Holder, in which the issue is whether times have changed and the 1965 Voting Rights Act should no longer apply to that Alabama county. — Hollingsworth v. Perry and United States v. Windsor, two potentially landmark cases on gay marriage. That said, SCOTUSblog will be live-blogging the action and will give us notice as soon as one of these cases is decided. We're embedding their live blog below. They usually fire it up at around 9 a.m. ET.